I’ll tell you one thing. There’s nothing like building up an old automobile from scratch and wiping out one of these Detroit machines. That’ll give you a set of emotions that’ll stay with you. Know what I mean? Those satisfactions are permanent. Along with its implied allegorical interpretation – that is, a hint of anti-establishment, anti-corporate bricolage practice – the above citation of a line of dialogue from Two Lane Blacktop (Monte Hellman, 1971) is inspired by the attention in this book to those films which, we realise in reading, had an enormous impact on that unique period of “New Hollywood” in the late 1960s and 1970s, yet do not remain a significant presence in the canon of American cinema, as perpetuated by both film studies as well as video retailers and television reruns. Films like Bonnie and Clyde (Arthur Penn, 1967), Easy Rider (Dennis Hopper, 1969), or Chinatown (Roman Polanski, 1974) and filmmakers like Martin Scorsese, Robert Altman, and Francis Coppola have been written about extensively, and are written about again here. But in addition we have discussions of films and filmmakers rarely present in other studies of New Hollywood. For example: an exciting ride through the career of Monte Hellman steered by Kent Jones, Bérénice Reynaud on Barbara Loden’s Wanda (1970), Adrian Martin on James Toback’s Fingers (1978), and Horwath on Lion’s Love (Agnes Varda, 1969), Cisko Pike (Bill Norton, 1972) and Tracks (Henry Jaglom, 1976) among others. Certain actors are emphasised like Karen Black, Warren Oates, or Jack Nicholson (including his work in story development). Jonathan Rosenbaum notes the gaps remaining in scholarly attention to a number of experimental filmmakers, also recalling the early shorts of Dennis Hopper, George Lucas, and John Milius, while Richard T. Jameson revisits the generational overlaps between filmmakers of classical and New Hollywood. And although many studies note the cross-fertilisation between Hollywood and B-movies or exploitation films, the chapters by Maitland McDonagh and Horwath provide sustained history and analysis of Roger Corman’s role in the history of “New Hollywood”. One of the great achievements of the book then is to open up the period and reveal there is not only much more academic research to be done, but many more films to watch (again or for the first time). It is appropriate, then, that the book originated in publications prepared for retrospective programs at the Vienna International Film Festival. Many of the essays are from the mid-1990s (some recently updated) except for the reprint of Elsaesser’s essay, “The Pathos of Failure: American Films in the 1970s”, originally published in 1976 in monogram, the film magazine named after the American B-movie studio referred to by Jean-Luc Godard in Breathless (1960). This article, outlining the tendency of New Hollywood cinema to replace the classical Hollywood narrative, structured by a resolution of a goal, with a journey destined for failure, is interesting to reread in light of another excellent recent book, Movie Mutations: The Changing Face of World Cinephilia, which shares four contributors with The Last GAPS (for an amusing play on this anagram, see Drelhi Rohlnik’s chapter) (1). In Movie Mutations, the contributors describe their shared interest in the physicality of the cinema, of a mise-en-scène and pacing constructed with the gesture. Before Deleuze introduced the concept of a “cinema of the body” in his second volume on the cinema (a text which, in his introduction, Elsaesser mentions as coincidental and contiguous with his observations) this article polemically detected such a shift for American cinema and American film criticism, where “the momentum of the action gives way to the moment of gesture and the body” (p. 292). Most studies of the New Hollywood, including this one, include some consideration of social upheavals of the time in America – in the belief that this cinema demands an ideological reading, and that a volatile political culture of the time was integral to its emergence. I think one can take Elsaesser’s observation on the breakdown of the dual narrative structure of classical Hollywood cinema that has been outlined most effectively by David Bordwell – the complementary resolutions of a romantic plot and a mission plot – and parallel it with the relationship between the personal (romantic) and the political (mission), where instead of one resolving the other, these two narrative strands are doomed to collide with violent repercussions (2). So as the New Hollywood gave birth to a mainstream form of “personal” filmmaking, the cinema of the 1970s reflects the collapsing border between public and private space, as well as the radical left’s concerns over the appropriate of alternative spheres of cultural production by the popular culture industry. No longer can Humphrey Bogart tell Lauren Bacall, like in The Big Sleep (Howard Hawks, 1946), “we’ll take up the subject of you and me after [the case is solved]”. Instead, the detective’s romance fails at the same moment his investigation does, like in Chinatown. The personal is the political, or, as Charlie (Harvey Keitel) screams in Mean Streets (Martin Scorsese, 1973), just before his business and his love life collide into a street lamppost, “nothing’s personal”. A whole new America came into view – one came across rural backwaters, motels, rust-belt towns and Bible-belt communities, out-of-season resorts and other places of Americana, whose desolation or poignancy had rarely been conveyed with such visual poetry, enriched by oddball characters, a love of landscape and a delicacy of mood and sensibility, even in scenes of violence or torpor (p. 38). The critics herein share that sensibility, though with little overzealous nostalgia. Contingent in approaching this work is something like a geographical dialectic of the New Hollywood, produced in the antimonies of Los Angeles and New York, and Hollywood and Europe (where Europe usually means Paris). Thus the cross-fertilisation of mainstream and alternative modes of production involves the contributions of New York experimental film culture and European cinephilia. The Last Great American Picture Show also describes a Los Angeles filmmaking culture of low-budget or avant-garde production, complementing the image of a non-specific place produced in a Hollywood dream factory. The book doesn’t get bogged down in historiographic debates, as many studies of this period are required to do, while one does get the sense that New Hollywood provides the yardstick for judging the aesthetics of subsequent American filmmaking. This line of dialogue from Two Lane Blacktop then – “those satisfactions are permanent” – leads me to wonder how it compares with another line of dialogue that has been subjected to heavy allegorical readings: from Easy Rider, Captain America’s “we blew it.” Despite this pathos of failure, what remains for these critics in The Last Great American Picture Show are lucid memories of a vibrant film culture. Yet of course, in this line from Two Lane Blacktop, GTO has coopted the story and sentiment of his younger competitors for another one of his tall tales told throughout the film. I still like the story though. 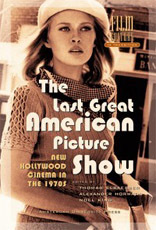 The Last Great American Picture Show: New Hollywood Cinema in the 1970s, edited by Thomas Elsaesser, Alexander Horwath, and Noel King, Amsterdam University Press, Amsterdam, 2004. Jonathan Rosenbaum and Adrian Martin (eds), Movie Mutations: The Changing Face of World Cinephilia, BFI, London, 2003. David Bordwell, Narration in the Fiction Film, University of Wisconsin Press, Madison, 1985.